The World Championship remained wide open with Clay Regazzoni (46 points) leading Jody Scheckter (41), Niki Lauda (38) and Emerson Fittipaldi (37). There were few changes int he driver-up from previous races with Chris Amon rejoining the fray with his own chassis and Jose Dolhem returning to Surtees in place of Jean-Pierre Jabouille. The Finotto team entered Carlo Facetti in place of Helmut Koinigg. There was much excitement amongst the tifosi with a Ferrari victory being a distinct possibility and there was much rejoicing when Niki Lauda took pole position from Carlos Reutemann (the winner of the previous race in Austria). 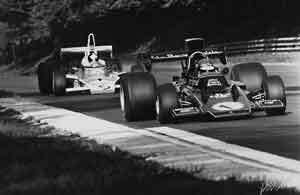 Behind them came the Brabhams of Carlos Pace and John Watson (using a works car after he had crashed the Hexagon BT44), making it three Brabhams in the top four places. Then came Regazzoni (Ferrari), Fittipaldi (McLaren), Ronnie Peterson (Lotus), James Hunt (Hesketh), Jean-Pierre Jarier (Shadow) and Patrick Depailler (Tyrrell). Scheckter had a bad time in qualifying and ended up 12th while Dolhem, Facetti, Derek Bell (Surtees), Mike Wilds (Ensign), Amon and Leo Kinnunen (AAW Racing) all failed to qualify. In the race the order at the front was unchanged on the first lap although in the course of the second lap Watson was overtaken for fourth by Regazzoni.. In the laps that followed Regazzoni overtook Pace and Reutemann to move up to make it the perfect Ferrari 1-2. The Brabham challenge then began to fade with Watson going off and dropping back, Reutemann retiring with gearbox failure and Pace suffering from tire troubles. This enabled Peterson to climb through to third place with Fittipaldi fourth and Scheckter fifth. This order remained unchanged until the 30th lap when Lauda's Ferrari began to trail smoke. Regazoni took the lead and the Austrian went on until his engine failed a couple of laps later. For the next 10 laps Regazzoni led and then the same happened to him. Peterson was in the lead but was under pressure from Fittipaldi. The Swede crossed the line less than a second ahead after 12 laps of battling. Scheckter finished third with Arturo Merzario a good fourth for Iso-Marlboro. Pace made it home fifth and Denny Hulme completed the points scorers in his McLaren. As the teams left Monza the World Championship was even closer than before with Regazzoni on 46pts, Scheckter on 45 and Fittipaldi on 43. Lauda was still in with a chance as well with 38.